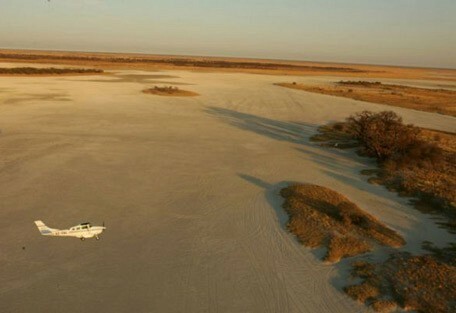 The Makgadikgadi Pans consists of the relics of a massive swampland that existed over much of northern Botswana between about 2 million and 40,000 years ago. This is an extremely fragile environment filled with fascination and interest; a destination for the true lover of remote experiences. The Makgadikgadi Pans is situated in the central region of the country and covers approximate 12 000 sq km; the largest salt pans on the planet. There are two important salt pans, the 6500 sq km Ntwetwe Pan and the somewhat smaller Sua Pan. These are the remains of a great lake that once covered most of northern Botswana, fed by rivers carrying salts filtered from the lake's catchment area. Because the basin had no outlet, the salts were concentrated in low lying areas. Less than 10,000 years ago, climactic changes caused the lake to evaporate, leaving only salt deposits, creating the wonderous area we now know as the Makgadikgadi Pans. For most of the year the area is dried up, however, as soon as the first rains fall, the region plays host to an alluring display of animal life. 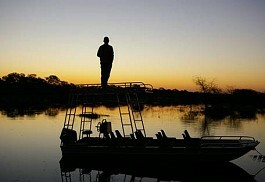 The water encourages one of Africa's great migrations. 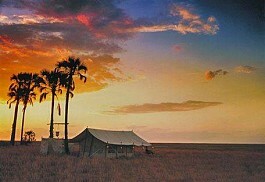 Makgadikgadi Pans is one of the most unique sights in Africa. The vast salt pans that appear barren were once the floors of lakes a swampland, which have a long time since evaporated. A massive baobab, Chapman’s Tree is believed to be 3 000 to 4 000 years old, and the only landmark for hundreds of miles around. It has been used as a guide for many thousands of years when people used to travel across Africa on foot and wagon. In the wet summer season, this reserve can offer good wildlife viewing, particularly when large herds of zebra and wildebeest begin their westward migration, attracting the following of predators. Archaeological sites on the pans are rich with ancient tools used by early humans, and the bones of the fish and animals they ate. 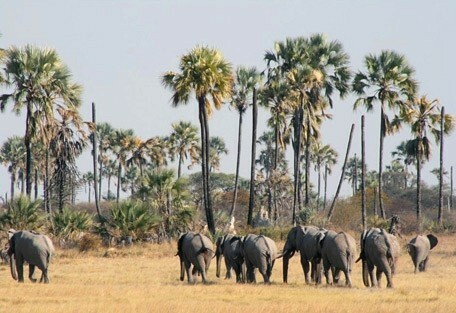 Nata Lodge is located among Mokolwane palms on the edge of the Makgadikgadi Pans. It is situated near the Nata sanctuary, which is on the edge of Sau Pan and is the breeding ground for a host of water birds including pelicans and flamingo in their thousands. Over 25 000 zebra and almost 10 000 blue wildebeest migrate here from the Boteti River in the west as well as from the Linyanti and Savuti regions to the north. The animals scatter sometime in March and April once the rainwater pans have dried up. The birdlife is abundant during the rainy season. Thousands of flamingos arrive to breed on the southern edges of Sua Pan. Pelicans and waterfowl congregate more towards the northern edge. 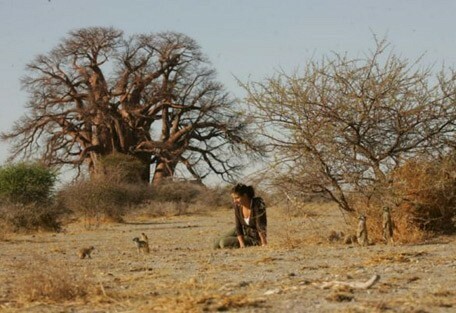 This is the domain of the brown hyena, a shy and elusive creature, as well as suricates, aardvarks and small bustard species. The brown hyena and aardvark are seen regularly as well as oryx, eland, caracal and red hartebeest, which are prominent. Sightings of elephant, lion, cheetah and kudu are not uncommon in the national parks. 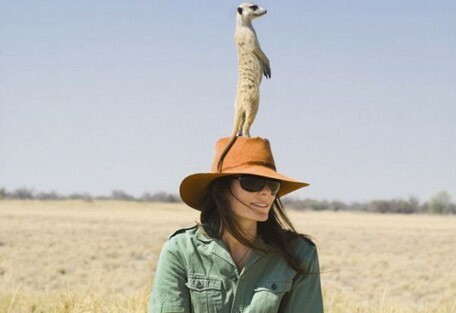 The vast difference between seasons in Makgadikgadi means that one should really visit twice - once in the rainy summer season and once in the dry winter season. The time in between these two distinct seasons is around October, when the heat climbs to around 45 degrees Celsius and the sky prepares to quench the land with the first of the rains. From November to March, the rains fall on Makgadikgadi, filling the salt pans with a layer of water and making instant mud. Often roads become impassable and game drives can't take place, which is why we recommend visiting in winter when it’s dry. 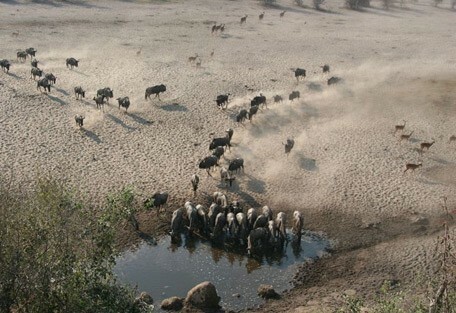 After the rains, from April to November, herds of zebra and blue wildebeest migrate westwards to the Boteti River, creating one of the biggest migration spectacles in Africa. Temperatures during this time are warm and pleasant during the day, but mightily cold at night. The Makgadikgadi Pans are treated as a day trip for guests staying at camps and lodges situated on the edge of National Park. There are 2 campsites within the park, however, we prefer to book our guests at one of our recommended accommodation so that they can enjoy guided tours into the park. 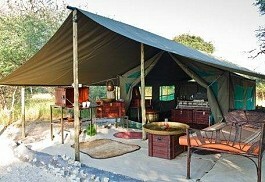 Jacks Camp is a classic desert safari camp accommodating 20 guests in ten large walk-in tents, each with ensuite bathroom with flush toilet and shower. 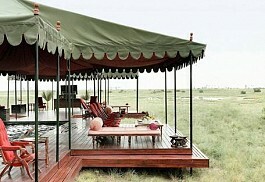 Decor reminiscent of 'old Africa' adds an air of romance to this unique camp. 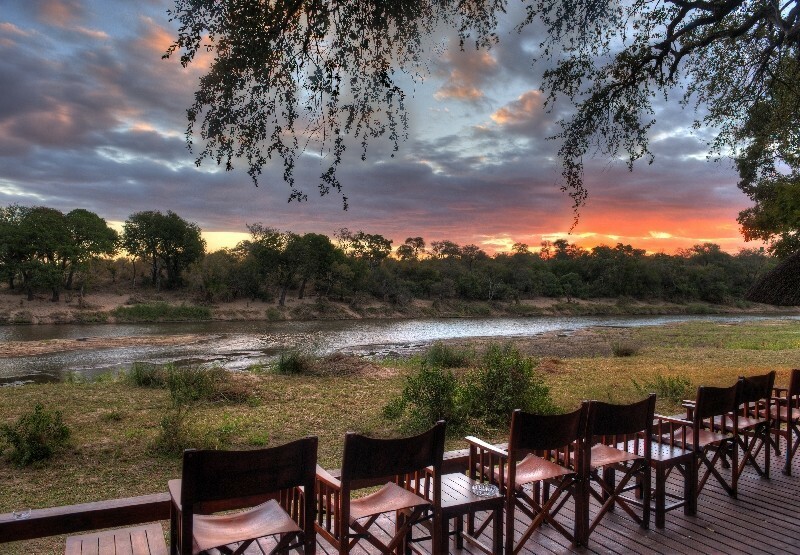 Located on the banks of the Boteti River, Leroo la Tau allows guests to view the massive herds of zebra that migrate to the area. A lodge with added luxury and beautiful views makes this a comfortable option. 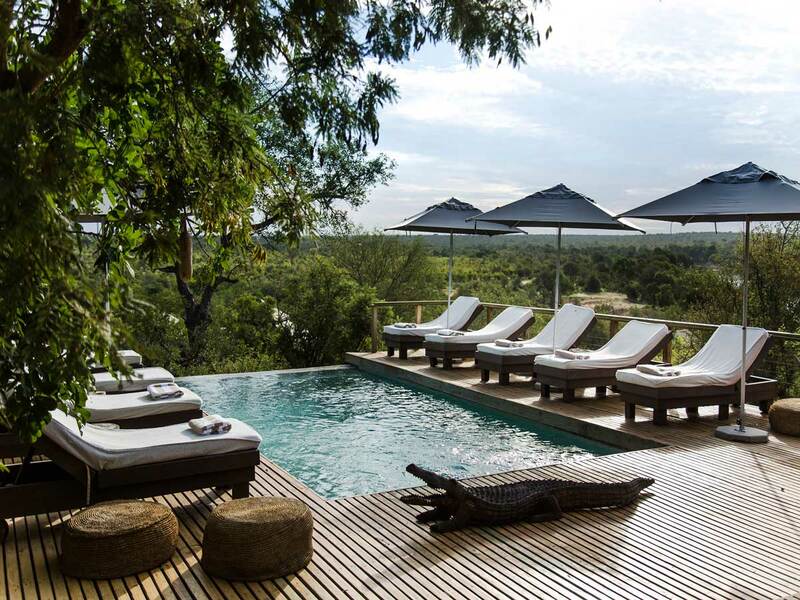 Nata Lodge is an oasis set among the Mokolwane palms on the edge of the Makgadikgadi Pans. 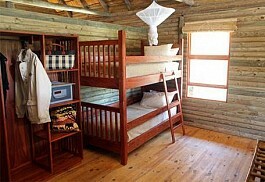 Accommodation is in raised canvas tents with thatched roofs, while activities include quad biking around the pans. 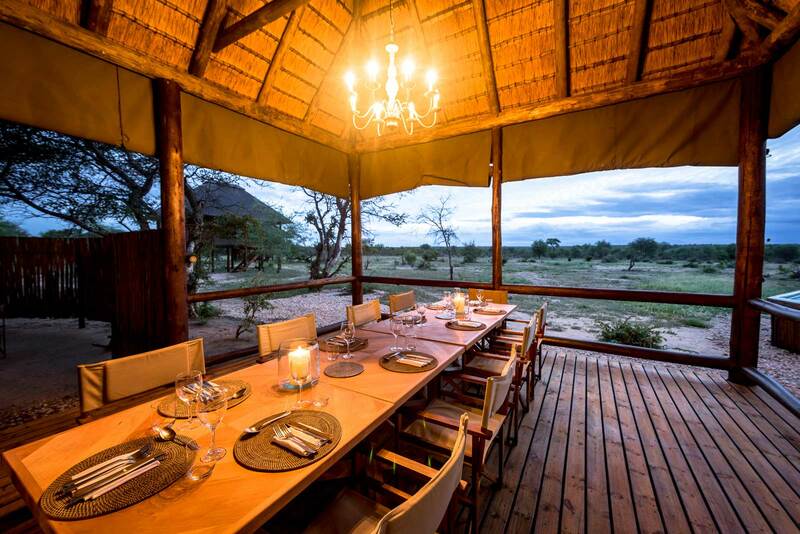 Lodges at Makgadikgadi Pans are located just outside, or overlooking the National Park, which is situated about halfway between Maun and Nata Lodge. 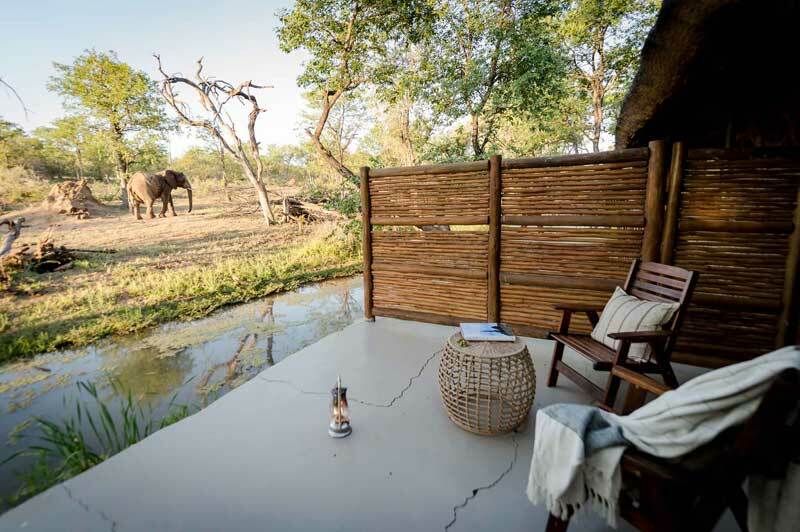 It is an awe-inspiring vision and there is certainly nothing else like it, so it is well worth a day trip from one of the surrounding lodges. 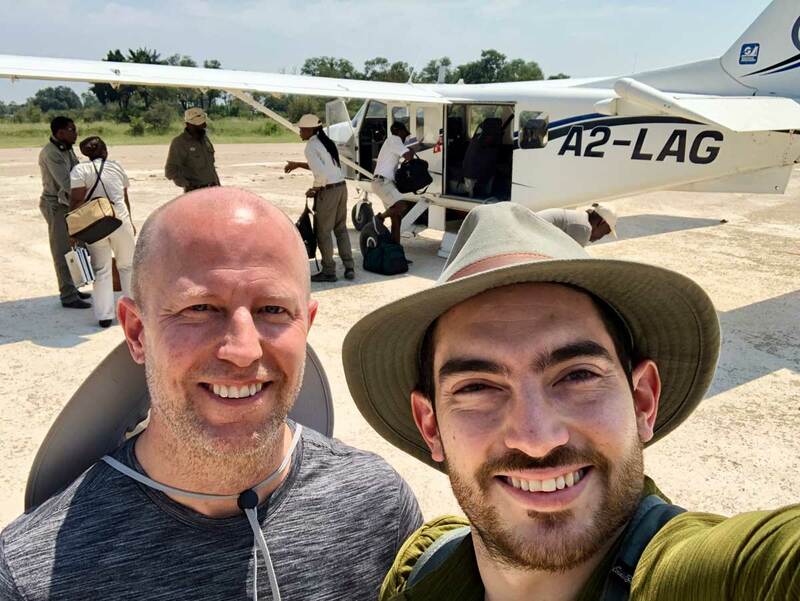 Sun Safaris will arrange for guests to be flown to Maun Airport in Botswana, and then to connect with a light air transfer to an airstrip near Makgadikgadi Pans. 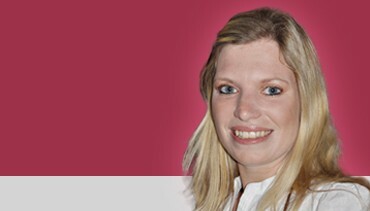 From there, the lodge host or guide will collect guests and drive them to their booked accommodation. In the dry months of the year, day trips into the Makgadikgadi Pans National Park are wonderful, but during the rainy season, roads may become impassable as the pans fill up with water.